He can’t stop pointing at the tree, he appears to love mince pies, and the flashing nose on his reindeer jumper blows his mind. 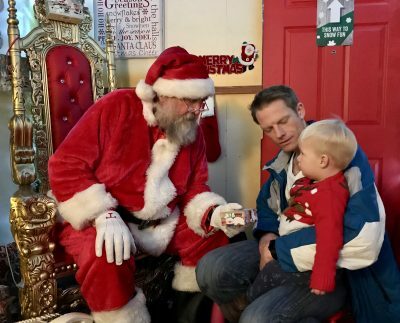 Only a visit to Father Christmas could make it feel more magical. 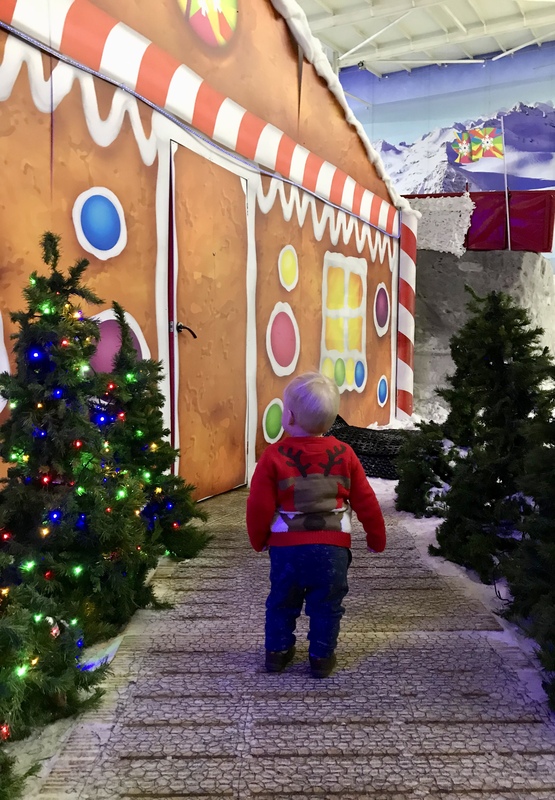 Earlier this week we were invited to visit the Christmas Grotto at Chill Factore. The guaranteed real snow made it the perfect setting for Tall Boy’s first encounter with the man in red. 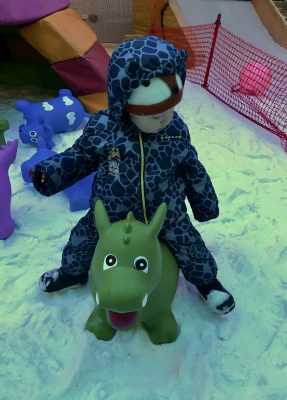 Our ticket included time in Mini Moose land; the special snow play area for little ones. 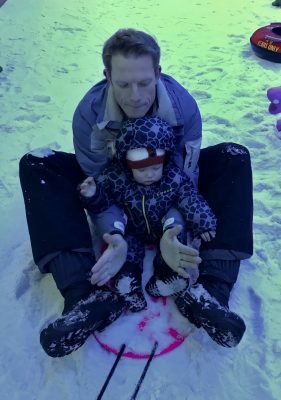 We dressed Tall Boy up in a snow suit and snow boots, which we hired from the venue, and introduced him to snow for the very first time. It’s safe to say he wasn’t sure about it. For starters he refused to keep his gloves on, so he wasn’t happy when he fell over and put his hands in the white stuff. 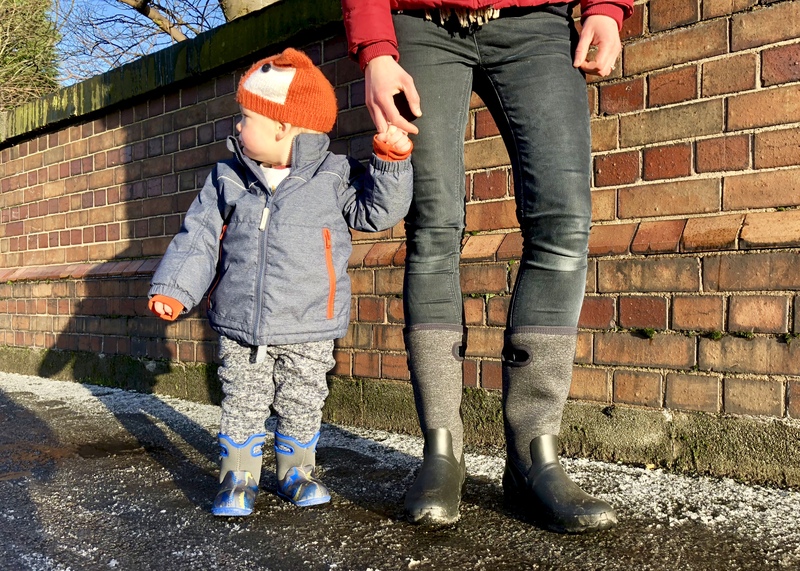 He was pretty good at walking on it though, loved the Wendy house and seemed to enjoy being spun around in a rubber ring, pulled along on a sledge and taken down the snow slide with mummy. The face, I admit, suggests indifference at best. We didn’t last our full half hour but for a sixteen month old I think we did pretty well. Then we went inside to wait our turn for Father Christmas. 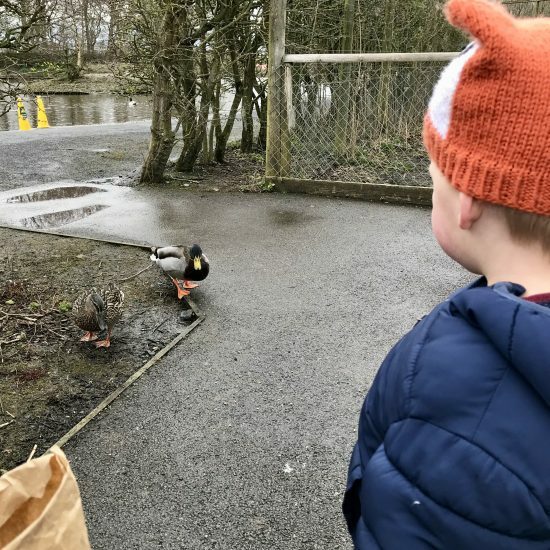 Luckily the organisers realise that a half hour queue is no fun for toddlers and they have provided colouring and toys to keep little ones amused while parents tag team it between checking their phones saving their place in the queue and entertaining said little ones. When our turn came we were shown through a door, out in to the snow, and down a path of twinkling Christmas trees towards a gingerbread house. …An amazing Father Christmas, sitting on a golden throne beside his roaring fire. 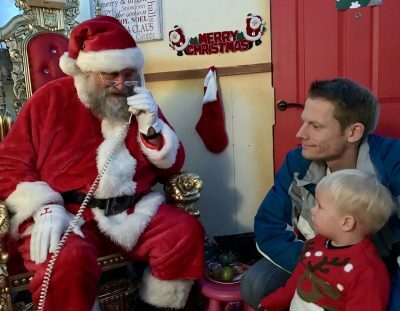 He was really good with Tall Boy, talking to him about what he wanted for Christmas, and telephoning Mrs Claus to make sure his requests (made via Mummy and Daddy of course) were added to his list. He showed him a plate of reindeer food, and told Tall Boy what he liked to be left out for him on Christmas Eve. Apparently this Santa prefers beer! Given my own childhood fear of anyone dressed up, I was expecting Tall Boy to be a little wary. Luckily, that’s all he was. 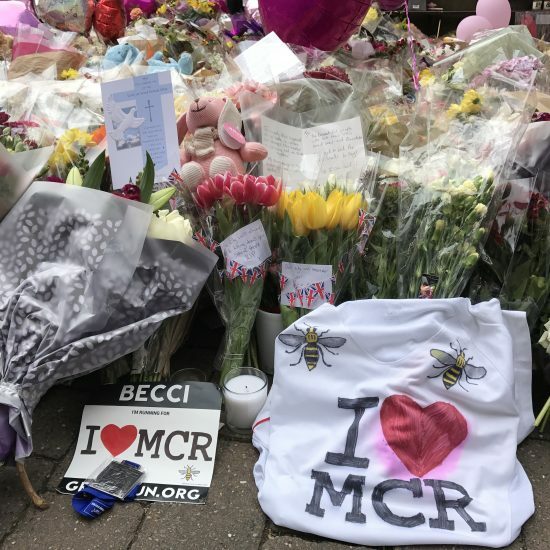 He was content to listen and there were no tears. I guess really he’s too young to be excited because he doesn’t understand what it’s all about. 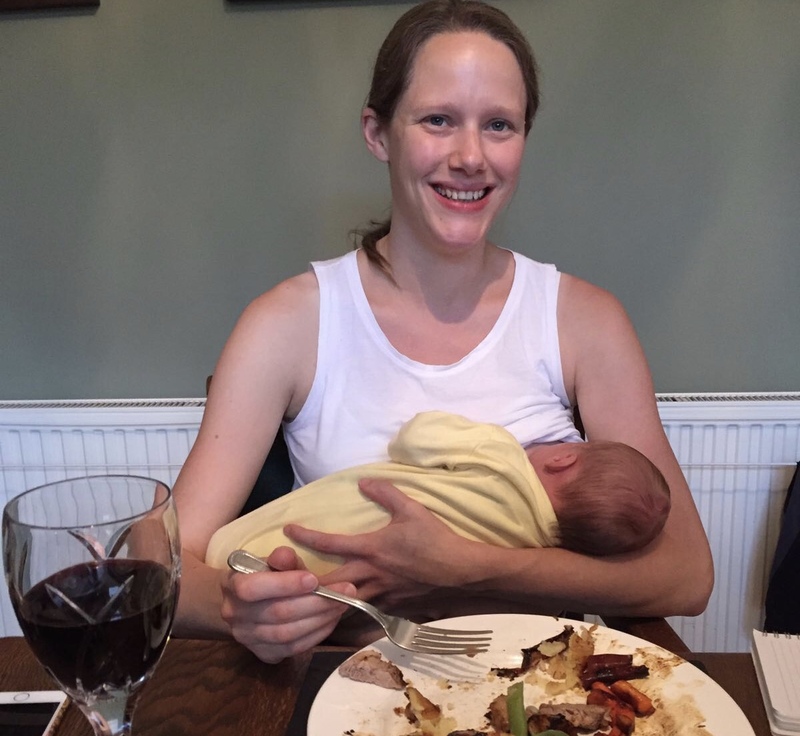 Mummy and Daddy were though and I’m sure he picked up on that. He did make us smile when he offered his gift back to Santa as we were leaving. 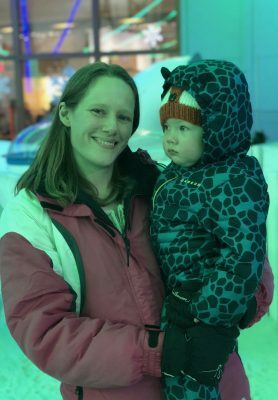 As this was our first visit to Father Christmas with Tall Boy, I don’t have anything to compare it to, but I came away feeling really festive and really impressed with the whole experience. I won’t give away the contents of Tall Boy’s parcel, but I will say that it was a good present. Perfect for his age, and something he’s already enjoying. 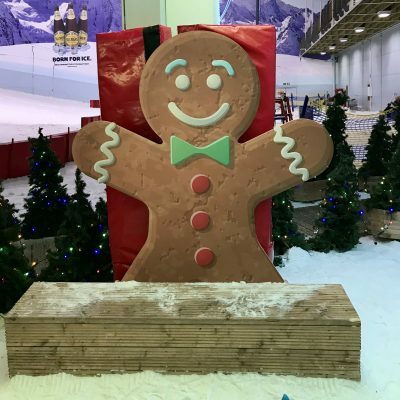 If you want to take your little ones to visit the Christmas Grotto at Chill Factore, the big man is in residence until 8.30pm on December 24th. That should give him just enough time to rest and fill up on mince pies before his late night commitments. 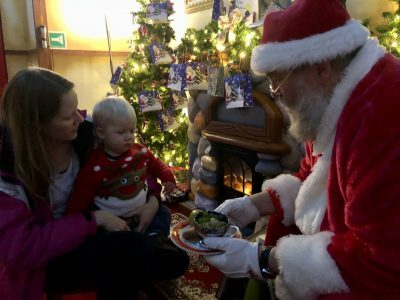 Prices start from £14.00 for under 4’s, which includes a visit to Father Christmas and half an hour in Mini Moose Land for 1 adult and 1 child. 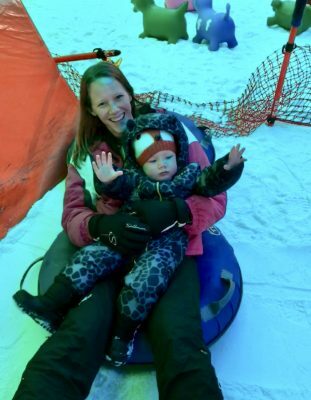 Bigger kids and their grown ups can play in the Snow Park for an hour after their visit to Father Christmas, with prices starting from £45.00. 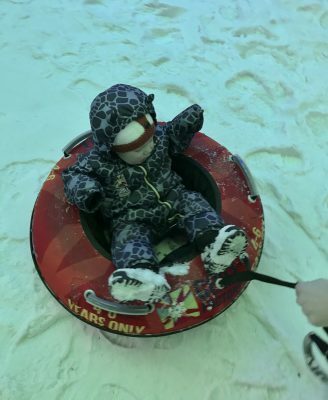 If you don’t have your own snow suits, you can hire them for an additional charge. 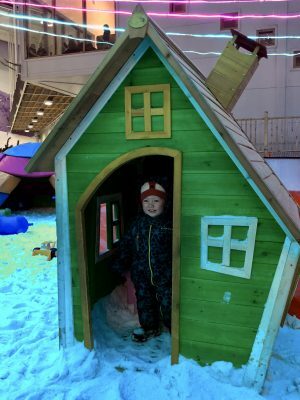 We were given tickets to the Christmas Grotto at Chill Factore in return for a review. Views are, as always, my own.